I think you misspoke, since you obviously meant to say the "Blessing" of Lolicon. Licks fishie and uses loli molesting jutsu on fishie! That_baka2 and Enigmatic like this. Good, good, let the lolicon flow through you. Biigoh and Enigmatic like this. That_baka2, hwjumeau, daimahou and 4 others like this. 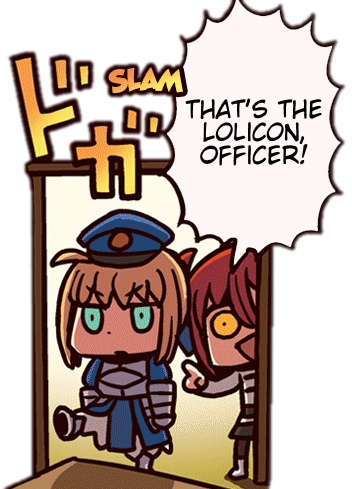 The lolicon police say so! That_baka2, beast_regards and Enigmatic like this. Allow me to present Exhibit A! Riko Saikawa! A loli who is a Lolicon! Marethyu, beast_regards, Biigoh and 1 other person like this. That_baka2, Marethyu, Biigoh and 1 other person like this. That_baka2, Marethyu, beast_regards and 2 others like this.